Looking out on a cold winter day and seeing a male Cardinal in all his glorious red is a real treat! There's nothing more beautiful that seeing a beautiful red cardinal. The male is so stunning. Absolutely Pat! I would have been thrilled to look out and see that wee splash of bright red! Super shot, Pat. Can't get any better than this. We had a lot of cardinals at our last house but none here. That's a shame! Oh I agree! To see a cardinal is a treat ! Cardinals are my favourite bird, such a lovely shot of colour in winter. 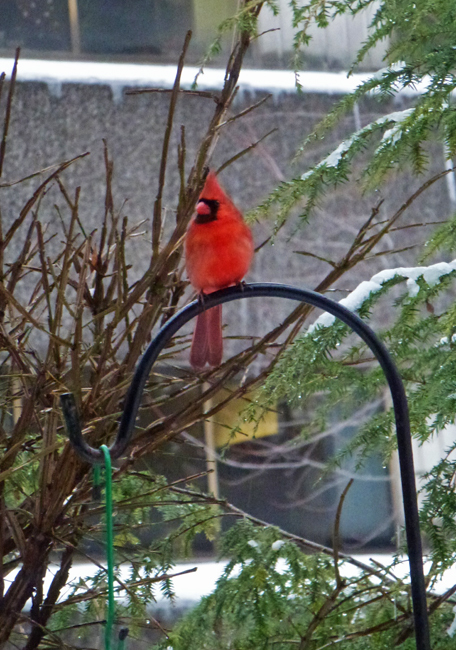 ...cardinals and winter go together. I thought all the cardinals came down to St. Louis for the winter. Hello, yes, the Cardinals are a treat to see. So pretty! Thank you for linking up and sharing your post. Happy Saturday, enjoy your weekend! A handsome fellow. I can't remember the last time I've seen one. Oh yes, what a beauty and he stands out even more against all that white. Gorgeous, Wish we had those here. What I wouldn't give to see one of these at my favorite park here in England! It is something else. I love these birds, so colourful. Always a delight! Especially in winter. Its a beautiful sight for sure. Gorgeous! I think he is posing for you. Mr. Cardinal enjoy your day!